I loved Sunday mornings when I lived in Japan, I would meet Suzuki Sensei at Shintomi-cho subway exit at 8am and we would walk 15 minutes to Kyobashi. Right opposite the community centre where we trained there was a homestyle Chinese restaurant; here we would meet Ohtsuka Sensei for breakfast before Karate class. I remember the menu vividly. Ohtsuka and Suzuki Senseis’ favourite dishes became my favourites too, as I was too humble to say what I wanted to order. Besides, I couldn’t read the menu and they would always pay, much to my embarrassment. 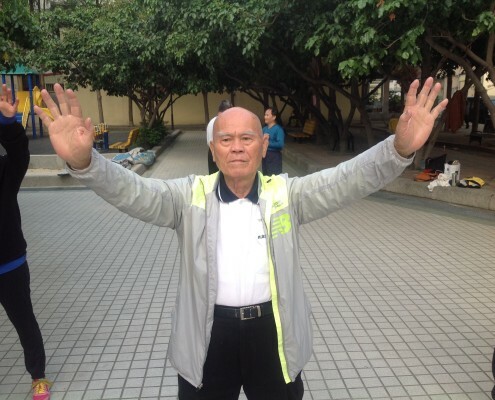 I grew accustomed to their generosity, and was very grateful for it as I had no money. 2 delicious dishes that were typically ordered were chicken with bitter melon (bitter gourd, or goya), and sliced pork with cabbage, soya bean paste, and hot chili oil, both served on a bed of fresh hot rice. 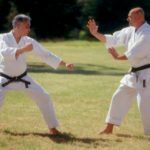 On one of these Sunday mornings there was more at stake than selecting the most delicious breakfast – I was asked to demonstrate Sepai to a packed Karate class.The first kata that Ohtsuka Sensei taught me was Sepai. 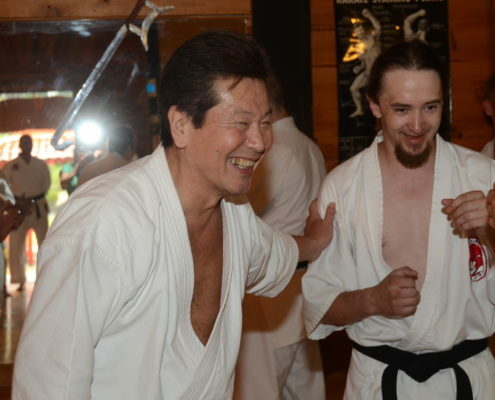 When I say ‘taught,’ I mean that he went through the entire 80-movement kata in only an hour; I was by no means an expert in Sepai, and in fact only had the most rudimentary foundation in the kata. 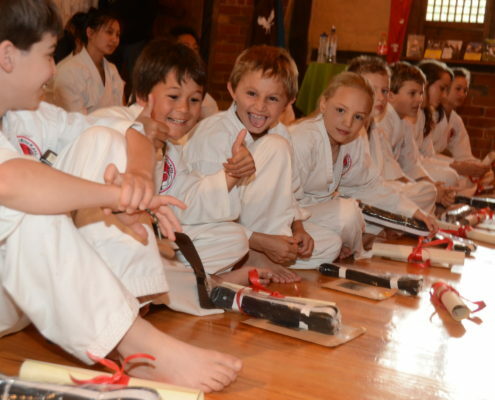 Therefore, I was most surprised when, during this Sunday morning training session, whilst I was training quietly in a corner, and students were being called up the demonstrate kata for their gradings, my name was suddenly called to demonstrate, of all things, the complex kata Sepai. 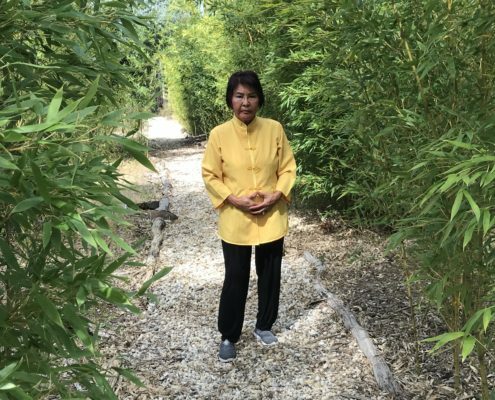 When my name was called, I protested that I did not know the kata well enough. After all, I had only just started! 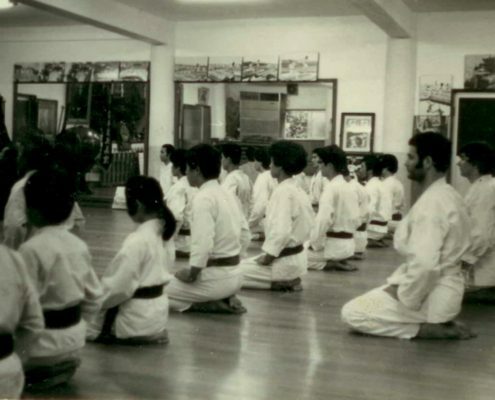 Ohtsuka Sensei just grunted at me and waved me towards the centre of the dojo; I was not about to argue with my Sensei. Demonstrating a kata that I did not know well, in front of so many people, most of whom were higher grades than me, was daunting. I could feel my knees trembling, my whole body was shaking, but there was nowhere to hide. I wish I could say that I somehow pulled together an amazing performance of Sepai, however this was not the case. 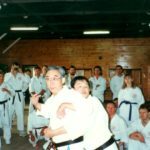 In fact, I performed perhaps the worst version of Sepai imaginable, but what happened next surprised me, and is an illustration of the brilliance of Ohtsuka Sensei’s teaching style. It would have been easy for him to absolutely tear apart my performance, and offer 100 corrections. Instead, he only corrected me on 2 things. After he made these corrections, he instructed Suzuki Sensei to work with me on these 2 details. Ohtsuka Sensei always caveated his expressions, when he did not want to put people down, with ‘perhaps.’ He would say a performance was ‘getting better’, which meant reasonable; ‘good’ which meant he really liked something, or ‘mmm, perhaps’, which meant abysmal. 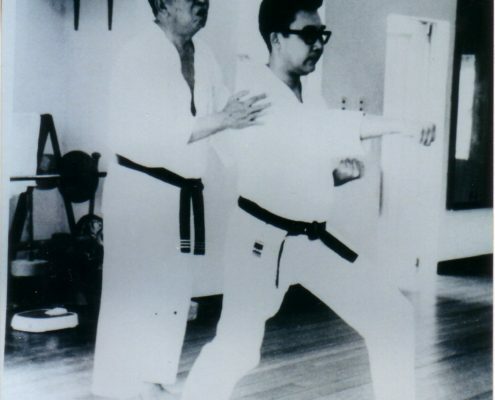 This was a very unusual teaching style for a Japanese Karate teacher in the 1970’s. 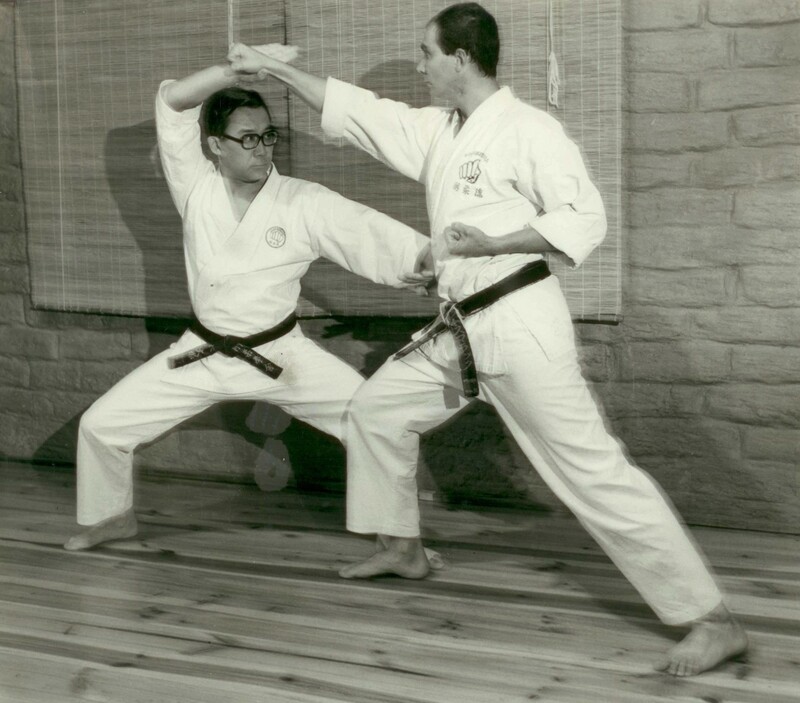 Typically, dojos embarrass students, and correction was often physically and mentally brutal, a style that Ohtsuka Sensei never embraced. That was an interesting lesson, that I still utilise my own teaching to this day. On the one hand, Ohtsuka Sensei put me, a young Karate-ka, in front of the entire class in a compromising position; there was no way that I was going to be able to perform that kata satisfactorily. 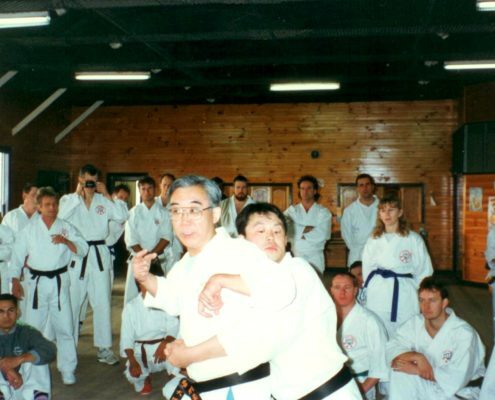 On the other hand, he also did not put me in this position just to tear me down; he used the experience as a learning tool, and as a platform to gradually improve my Karate. Ohtsuka Sensei would often say ‘your Karate training should progress on a gradient of 1-20, not unlike a spiral staircase. As you advance in your training, you slowly spiral upwards, your technique will feel and appear different. On the bottom of the staircase you have basic tsuki (punch), keri (kick) and uke (block). 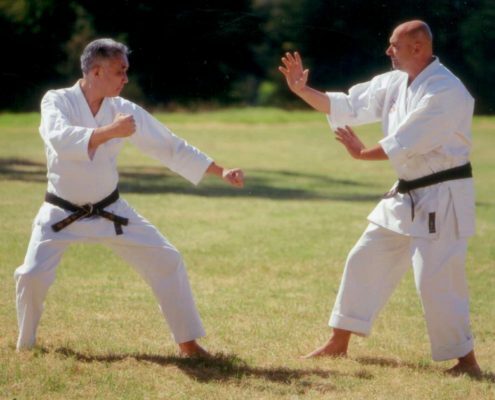 These basics are still with you as you progress higher, but they take on a different perspective after you study Karate for 15, 20, 25 years or beyond.